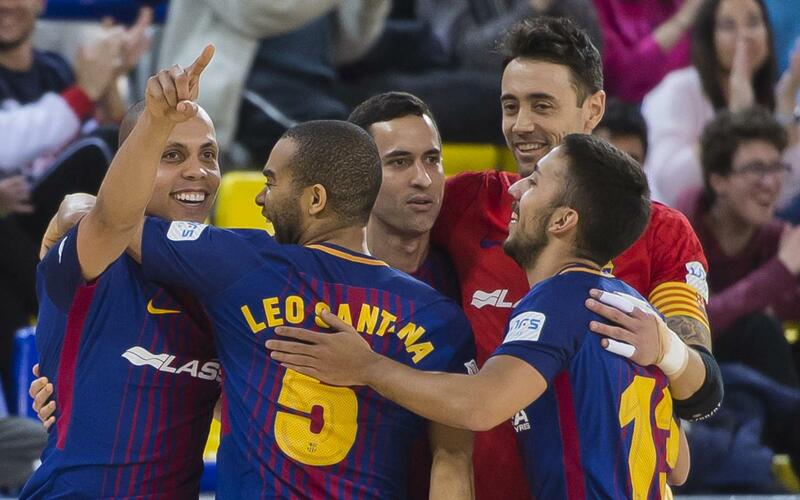 FC Barcelona Lassa beat Peñiscola RehabMedic in the 27th game of the LNFS in the Palau Blaugrana with braces from Ferrao, Léo Santana, a strike a from Rivillos and an own goal. The home side went ahead as early as the fifth minute and from that moment the match was only ever going to have one winner. Rivillos fired home a second with ten minutes played. However, after going close on several occasions, it was not until the 17th minute that Ferrao added a third from the penalty spot, his 24th of the season making him top scorer in the league. In the second half an own goal from Esteban made it 4-0 before the same player pulled one back for Peñiscola. The excellent Léo Santana added a fifth not long after. Another great move from Andreu Plaza's team allowed Santana to add a second and Barça Lassa's sixth of the evening to round off a great win that gives the team a boost heading into the decisive phase of the season.